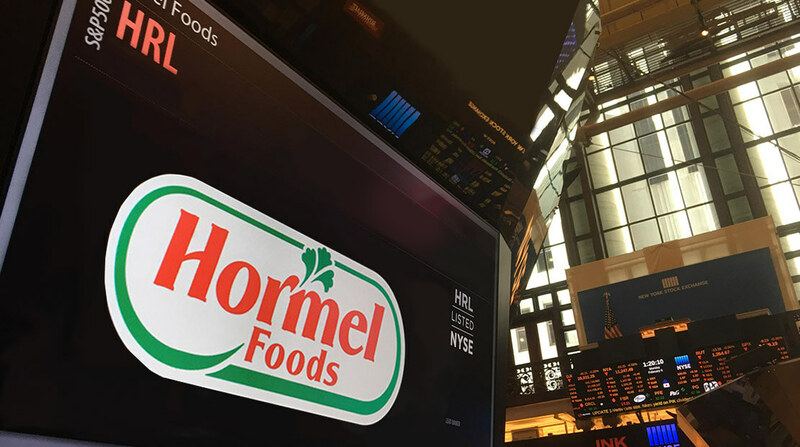 Hormel Foods Corporation (NYSE: HRL), a leading global branded food company, today reported results for the second quarter of fiscal 2018. All comparisons are to the second quarter of fiscal 2017 unless otherwise noted. Volume and sales increases benefited from the inclusion of the Columbus and Fontanini acquisitions in addition to strong retail sales of Hormel® Natural Choice® products and foodservice sales of Hormel® pepperoni and Hormel® Bacon 1™ fully cooked bacon. Organic volume decreased due to lower hog harvest volumes. Refrigerated Foods delivered segment profit growth of 18% despite a 25% decline in commodity profits, a double-digit increase in per-unit freight expenses, and higher advertising expenses. Strong results were delivered by our branded retail and foodservice businesses in addition to the inclusion of the Fontanini and Columbus acquisitions. Low-single-digit sales growth in our core Grocery Products portfolio, led by Wholly Guacamole® dips, the SPAM® family of products, Herdez® salsas, Dinty Moore® stew, and Hormel® chili, was more than offset by significant sales declines across the CytoSport portfolio and our contract manufacturing business. Total Grocery Products segment profit was down due to increased promotional activity and lower volumes at CytoSport and lower earnings from our contract manufacturing business. Sales declines were primarily due to lower whole bird pricing and volume as a result of continued oversupply of turkeys in the industry and excess meat in cold storage. Sales declines of whole birds were partially offset by increased retail sales, led by Jennie-O® lean ground turkey and Jennie-O® Oven Ready™ products. Segment profit decreased as a result of lower profits from whole bird and commodity sales, double-digit increases in per-unit freight costs, and increased advertising. International volume and sales increases were related to strong results in China, increased export sales, and the inclusion of the Ceratti business. Earnings increased on improved profitability in China due to lower raw material costs but were partially offset by higher advertising expenses and lower branded export margins. Selling, general and administrative expenses increased due to the impact from acquisitions and higher advertising expense. Advertising expenses were $37 million compared to $30 million last year. Full year advertising expenses are expected to increase by approximately 20% over last year. Operating margin was 13.1% compared to 14.4% last year. The effective tax rate was 20.0% compared to 33.2% last year due to the passage of The Tax Cuts and Jobs Act in December 2017. The full year effective tax rate is expected to be between 17.5% and 19.5%. Capital expenditures in the second quarter were $87 million compared to $39 million last year. Full year capital expenditures are expected to total $425 million. Key projects include bacon capacity increases in our Wichita, Kans., facility, a new whole bird facility in Melrose, Minn., modernization of the Austin, Minn., plant, and projects designed to increase value-added capacity. Depreciation and amortization expense in the second quarter was $41 million compared to $32 million last year. Full year expenses are expected to be approximately $160 million. Share repurchases to date total $45 million, representing 1.3 million shares purchased. The Company repaid $70 million in short-term debt in the quarter. The Company paid its 359th consecutive quarterly dividend at the annual rate of $0.75 per share, a 10% increase over the prior year. Working capital increased to $702 million from $625 million in the first quarter, primarily related to a higher inventories from acquisitions and lower accounts payable. Cash on hand decreased to $262 million from $386 million for the first quarter as the Company continues to pay down short-term debt related to the Columbus Craft Meats acquisition. Total debt is $810 million. The debt is split between short-term borrowings of $185 million and long-term borrowings of $625 million. The Company remains in a strong financial position to fund other capital needs. A conference call will be webcast at 8:00 a.m. CT on Thursday, May 24, 2018. Access is available at www.hormelfoods.com. The call will also be available via telephone by dialing 800-239-9838 and providing the access code 9118102. An audio replay is available by going to www.hormelfoods.com and clicking on Investors. The webcast replay will be available at 11:00 a.m. CT, Thursday, May 24, 2018, and will remain on the website for one year. The non-GAAP adjusted financial measurements of organic net sales and organic volume are presented to provide investors additional information to facilitate the comparison of past and present operations. The company believes these non-GAAP financial measurements provide useful information to investors because they are the measurements used to evaluate performance on a comparable year-over-year basis. Non-GAAP measurements are not intended to be a substitute for U.S. GAAP measurements in analyzing financial performance. These non-GAAP measurements are not in accordance with generally accepted accounting principles and may be different from non-GAAP measures used by other companies. Organic net sales and organic volume are defined as net sales and volume excluding the impact of acquisitions and divestitures. Organic net sales and organic volume exclude the impacts of the acquisition of Columbus Craft Meats (November 2017), the acquisition of Fontanini Italian Meats and Sausages (August 2017), and the divestiture of Farmer John (January 2017) in Refrigerated Foods and the acquisition of Ceratti (August 2017) in International. The tables below show the calculations to reconcile from the non-GAAP adjusted measures to the GAAP measures in the second quarter and second quarter year-to-date of fiscal 2018 and fiscal 2017.